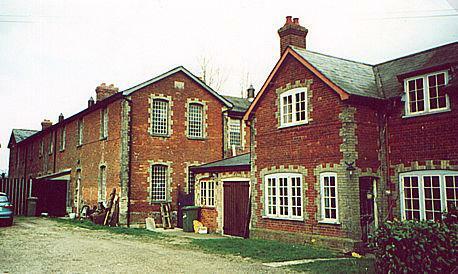 Winfarthing had a workhouse in use in 1811 and 1821 as noted by the censuses of those years. White's Norfolk Directory of 1836 noted that the parish of Banham had been renting a building called the Guildhall for use as a workhouse, together with just over three acres of land. County of Norfolk: Banham (2), Blo' Norton, Bressingham, Bridgham, New Buckenham, Old Buckenham (2), Eccles, Fersfield, Garboldisham, Gasthorpe, East Harling, West Harling, Kenninghall (2), North Lopham, South Lopham, Quidenham, Riddlesworth, Roydon, Shelfanger, Wilby, Winfarthing. The population falling within the Union at the 1831 census had been 11,873 with parishes ranging in size from Riddlesworth (population 76) to Banham (1,297). The average annual poor-rate expenditure for the period 1833-35 had been £10,833 or 18s.3d. per head of the population. 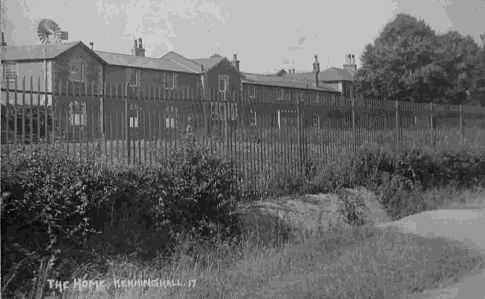 A new Guiltcross Union workhouse was erected in 1836-7 at Kenninghall. The Poor Law Commissioners authorised an expenditure of £4,727 on construction of the building which was intended to accommodate up to 300 inmates. It designed by William Thorold who was also the architect of workhouses for the Depwade, Thetford, and Walsingham Unions. His design for Guiltcross was based on Sampson Kempthorne's model cruciform plan published by the Poor Law Commissioners in 1835. It had a entrance range at the south-east which contained the porter's lodge, board-room, offices and so on. To the rear, radiating from the central supervisory hub, were four accommodation wings for the various classes of inmate (male/female, old/able-bodied etc.). The areas between the wings were divided in segregated exercise yards. Service and workshop buildings formed the square perimeter of the workhouse. The site location and layout are shown on the 1904 OS map below. There was a fire at the workhouse on 11th May, 1876. Considerable damage was done to the women's and sick wards. 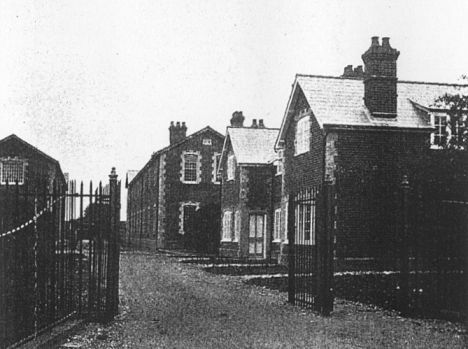 As a result of the damage, the children in the workhouse were moved to accommodation at Wortham, a situation which continued until September 1882. The Guiltcross Union was dissolved in 1902 and its constituent parishes were distributed between the neighbouring Unions of Depwade and Wayland. 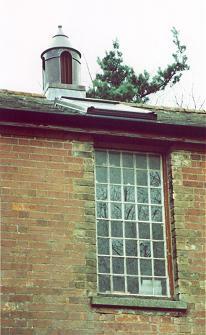 The former Guiltcross union workhouse was subsequently bought by the Revd Harold Burden, a former missionary, and a leading figure in the creation and operation of reformatories for inebriates at the turn of the 19th century. Following the passing of an Inebriates Act in 1898 which enabled the compulsory detention of criminal inebriates in certified reformatories, Burden set up a charity called the National Institutions for Inebriates (NII). The NII set up a network of institutions, including one in another former workhouse at Lewes in Sussex which opened as the Southern Counties reformatory in 1902 licensed to accommodate 130 female inebriates who were admitted directly from court. 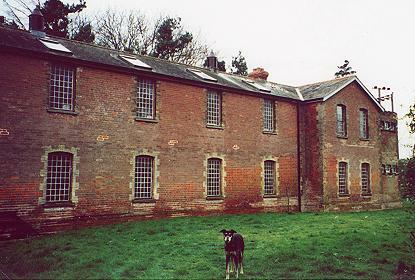 Guiltcross opened in 1904 as the Eastern Counties or East Harling reformatory, taking both men and women, and also epileptic and diseased inmates. 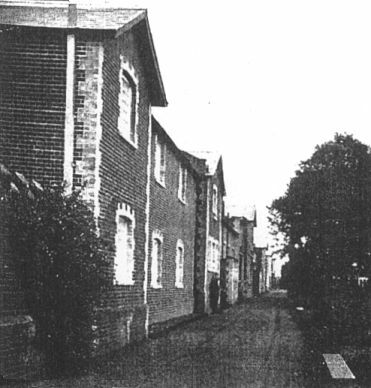 The former workhouse buildings were expanded in 1904-6 for their operation as an inebriate reformatory with four additional blocks being erected including a large L-shaped infirmary at the east of the site. A plan below (click on the plan for an enlarged version). Guiltcross inebriate reformatory plan, c.1908. Guiltcross from the south-east, c.1908. Guiltcross main building from the south, c.1908. Guiltcross from the south-east, c.1910. Guiltcross from the south, c.1910. Guiltcross 1906 infirmary from the north, c.1908. Guiltcross 1906 infirmary from the north-west, 2000. Guiltcross 1906 infirmary from the north-east, 2000. Guiltcross 1906 infirmary detail, 2000. Guiltcross 1906 infirmary from the south, c.1908. Guiltcross 1906 infirmary from the south, 2000. In 1911, because of falling numbers and changes in the treatment policy for inebriates, the unit began to provide care for mental deficiency cases, with 20 "boys" aged 15-25 being admitted on 19th January. With the passing of the Mental Deficiency Act in 1913, this shift continued and by November 1914, only 35 inebriates remained, almost all of whom were discharged that month to the NII's reformatory at Brentry in Bristol. 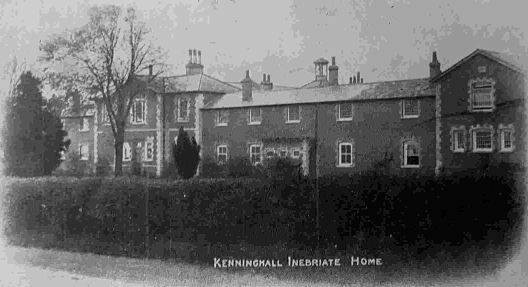 By the end of 1915, there were 392 mentally deficient boys in residence at the East Harling "colony" which now operated under the umbrella of the National Institutions for Persons Requiring Care and Control (NIPRCC), another organisation set up by Burden in 1908. However, the national Board of Control decided that the facilities at the colony were not suitable and it closed at end of 1916. The last 3 inmates left on 1st January 1917 and its licence was surrendered. During the First World War, the buildings housed German prisoners of war who worked on the land. The Revd Burden retained ownership of the building for the rest of his life but but it was sold on his death in 1933. 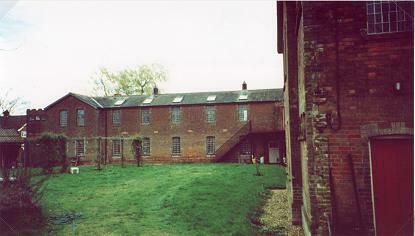 The main workhouse building is believed to have been demolished in the 1950s. 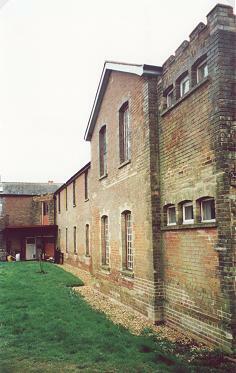 The surviving building on the site is believed to be an infirmary block added at the east of the main workhouse. It was used for some years as a grain store but has now been converted for residential use. Norfolk Record Office, The Archive Centre, Martineau Lane, Norwich NR1 2DQ. Few records survive — holdings include: Guardians' minute books (1836-99). Carpenter P.K. (1996) Rev. Harold Nelson Burden & Katherine Mary Burden - pioneers of inebriate reformatories and mental deficiency institutions. J Royal Soc Med, 89: 205-9. Digby, Ann (1978) Pauper Palaces . Routledge & Kegan Paul. Thanks to Peter Carpenter for information on the Revd Burden and inebriate reformatories.